It’s been very quiet in my Sussex garden this summer – we worked hard in the spring, clearing and planting and growing lots in the greenhouse and cold frames, planting out and feeding, and then with the hot summer, everything slowed right down like a 45 rpm record played at 75. My goodness that sun – blazing away, day after day, brick walls holding the heat and releasing them like storage heaters over night and the poor plants, doing their best. I did my usual Chelsea chop in early June which took away some of their tendency to flower too soon and then, because of going away, also went round and did a Hampton Court Hack, removing a further third of growth on the perennials. Looking back I believe it was the best possible treatment but at the time it felt drastic and right through late July and into August I did wonder what on earth I had done. Basically the plants went into survival mode, no buds, little flower or leaf growth. And then the rain came with the cooler temperatures and the entire garden went ‘Phew, thank goodness that’s over’ and started to grow like mad. 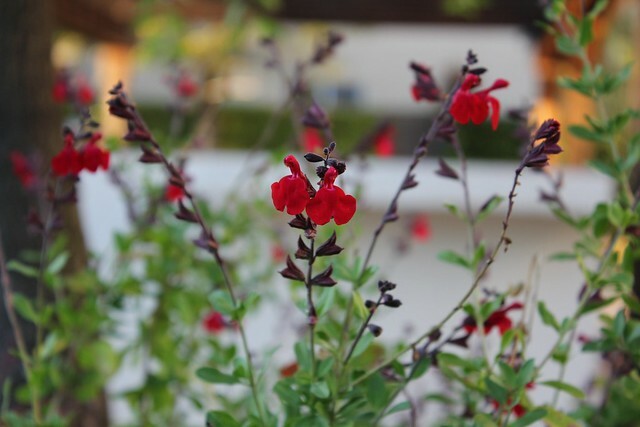 Throughout it all, one plant family has been astonishing in its vigour and determination to flower – the shrubby Salvias, often called S. Greggii x with a name or S. name x jamensis. Given that they come from Mexico, Central and South America they probably felt totally at home in our 30+ temperatures. I’d give them a soak once a week from a watering can (washing up water usually) and they just kept on putting out buds. If they got a bit leggy, a tendency with such slim stems, then I snipped them back and off they went again, providing bees with nectar and me with welcome colour. There are so many to choose from – a browse through Dyson’s Nurseries catalogue will convince you of that – suffice to say that the colour range is enormous, and there is one for every garden (or more than one if your willpower is as weak as mine). Do I have favourites? Yes of course I do, and here they are, by and large all with the same small butterfly flowers on long wiry stems. Snip back the dead flower stalk to the next pair of buds and the display continues. Unlike the herbaceous salvias there are no true blues here for some reason – but there are plenty of blue-purples for you to try. I did have African Sky last year – a glorious blue, but the Beast from the East finished it off, as it did my S Uliginosa, the bog Salvia. The damp conditions it likes turned into permafrost for weeks and it never came back alas. But one of the lovely things about salvias of all sizes and shapes and colours is that they don’t break the bank so if something does turn up its toes and you really miss it, then it can be replaced fairly easily. A word here about the tall Salvia so beloved of garden designers and optimists – Salvia Amistad with big purple hooded flowers and dark stems. It is not a sun lover, preferring to have damp roots and afternoon shade. I found out the hard way , and had to replace all of mine and am about to move them again to find somewhere where they will graciously consent to flower and survive until 2019. Cultivation is straightforward – do your research on what conditions your Saliva prefers (usual right plant right place mantra here) and it will thrive. The shrubby ones do get woody after a year or two but respond well to fairly firm pruning, though eventually their shape may go and you need to take a decision on their future. Although why not hedge your bets and take cuttings now to ensure a supply of new plants next year? It’s so easy to do – just take lengths of non-flowering stem (or nip out the flowering point), strip off all but the top leaves, dip the end into rooting powder and then insert into gritty compost around the side of your flower pot. Water well and put into a cold frame. Actually I rather resented having lots of pots with empty middles so I put a smaller pot into the centre of a larger one and now have double rows of cuttings rooting away happily. As soon as you see fresh growth at the top and some roots coming through the bottom of the pot you can gently remove the cuttings and pot them on individually, protecting from frost if you can until the time comes next spring when you can wander round your garden, looking for suitable places for your new treasures to flower no matter what the summer weather decides to give us.